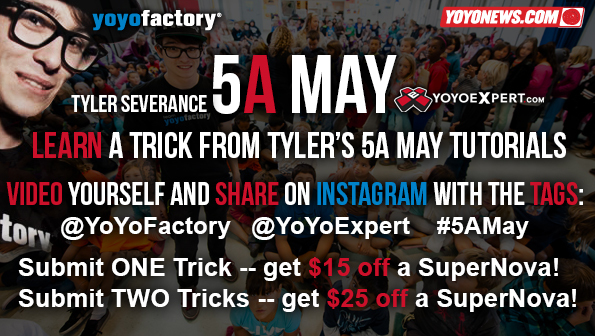 YoYoExpert Blog & Yo-Yo News – 5A May – Tyler Severance Tutorials – Round 2! To celebrate 5A May YoYoNews, Tyler Severance, and YoYoExpert have teamed up to bring you some exclusive tutorials with motivation to learn! Here is Round TWO of the tutorial videos! Buddha Redirect, Floating Beesting, Danny Rejection, Danny Front/Back Door, Dana Bennett!